The front page of the Rothwell Times in January 1892. Click on the dates below to read items from local newspapers, principally the Rothwell Times which was published weekly on a Friday from 1873. For some years items about Oulton and Woodlesford have been transcribed and for a few selected years there is a pdf copy of a full year of the paper, although some dates may be missing. A full set of the Rothwell Times on microfilm (apart from 1879) is available in the local studies section of the Leeds Central Library. Initially the Rothwell Times had only one page of local news but as the paper grew each edition usually consisted of 8 pages. 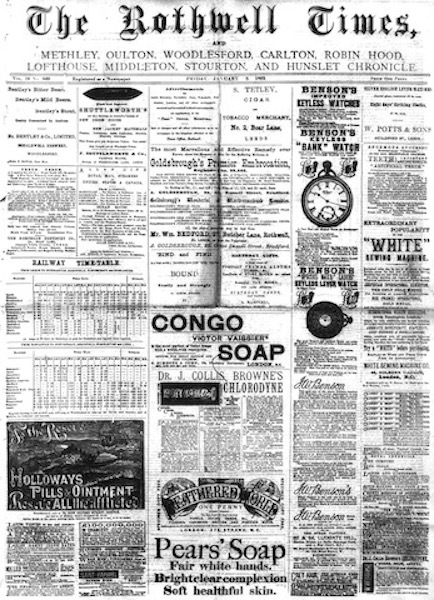 As with most newspapers of the time the front page usually carried advertisements, mainly for Leeds based shops, along with a railway timetable. Pages 2 and 3 and 6 and 7 were taken up with syndicated national and international news reprinted from other newspapers. Reproduced here are pages 4, 5 and sometimes page 8. They carried Rothwell area advertisements, news from the district, sporting fixtures and reports. The main focus was on the meetings of local government including the school boards and Poor Law guardians. Church and chapel activities were also prominent and from time to time political controversies were reflected in letters to the editor, although many were printed anonymously. The paper was established and edited by Andrew Marshall. He was born in 1844 at Twillingate, an island just off the coast of Newfoundland, where his father, the Reverend William Marshall from Durham, was a Methodist minister. After William died in 1846 his mother brought Andrew to live in Newcastle with her husband’s family. Eventually they moved to Rothwell in 1855 after she married Richard Seanor, the owner of the Rothwell match factory. By the time he was 17 years old Andrew was apprenticed to a cloth merchant but a few years later he established a stationery shop on Commercial Street in Rothwell and it was from there that the Rothwell Times was created. 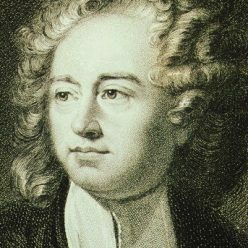 His son Percy later joined the business as a printer and compositor. By 1911 Andrew Marshall had become the rate collector for the Rothwell Urban District Council. He’d also been clerk to the Rothwell school board and throughout his life was active in the Methodist church. He died in 1923. News about the Rothwell district also featured regularly in the Wakefield Express, the Leeds Mercury and its rival, the Leeds Intelligencer, which became the Yorkshire Post. A competitor to the Rothwell Times, the Rothwell and Methley Free Press, was started in 1890 and was published for 11 years. Another paper, the Rothwell Express, only seems to have been published for a few months in 1901. The Rothwell Times itself was absorbed into the Rothwell Courier and Times in 1913 and it survived until 1923. Another weekly paper, the Rothwell Advertiser, started publication in 1889 but it only carried advertisements until it was relaunched in 1968. From then until its closure in 1992 it carried regular news reports and photographs of local affairs. Bound copies can be found at Rothwell library along with the Rothwell Record, a monthly magazine started in 1992 which continues to the present day. Click on the dates below to download digitised pdf copies of the Rothwell Times. Note: some of these are large files. 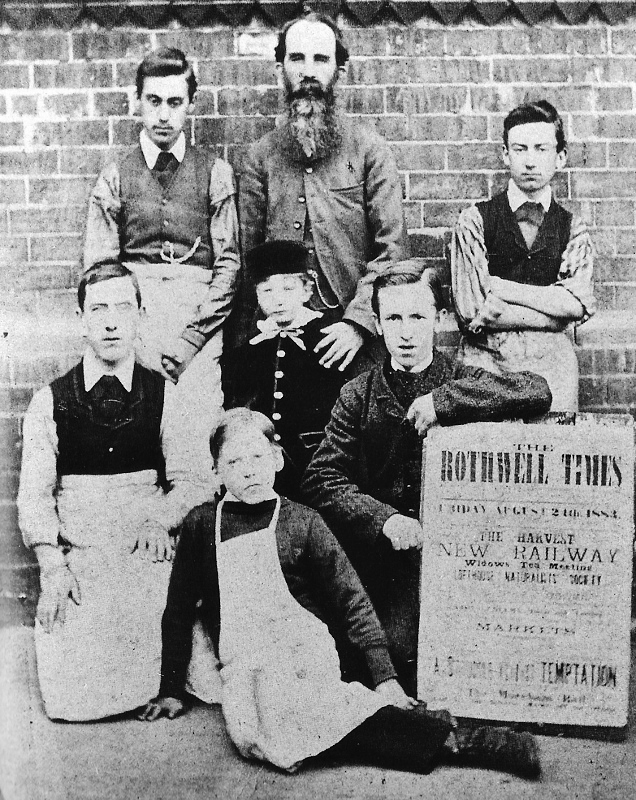 The Rothwell Times was ten years old when this photo of Andrew Marshall and his staff was taken in 1883. The billboard is marking the passing of the act for the East and West Yorkshire Union Railways through Rothwell, Woodlesford and Oulton to Drax. Despite the opitmism a lack of capital and railway politics meant that most of the line had to abandoned and a much shorter section from Rothwell to Lofthouse was finally opened in 1891. It was later extended to Stourton.